This entry was posted in News & Views, Quotes and tagged BLOTUS, coincidence, fake news, fake president, funny, Liar-In-Chief, truth on July 12, 2017 by Ray Buchanan. When I was young I eagerly read the cartoons because they were funny. Most of the ones I see today are no longer funny. They do, however, clearly point out the deepening hypocrisy of many who profess to follow Jesus of Nazareth. The one below is but one example. 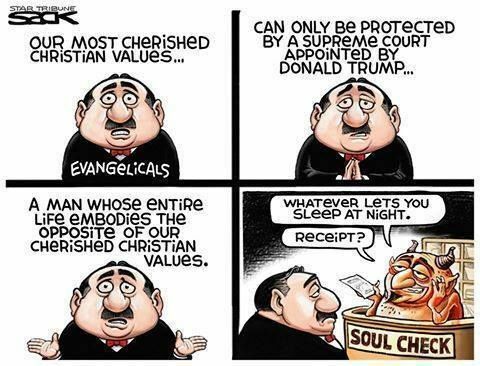 This entry was posted in News & Views, Quotes and tagged BLOTUS, cartoons, devil, Evangelical Christians, funny, hypocrisy, Jesus, Nazareth, opposite, soul, Supreme Court, truth, values on April 17, 2017 by Ray Buchanan.